No doubt wary of the inevitable raft of litigation – that will cost it hundreds of €millions – and faced with mounting evidence of the obvious connection between exposure to low-frequency wind turbine noise and infrasound and health problems (such as sleep deprivation and cardiovascular disease), the German government has determined to simply destroy the evidence. Evidence of the kind that will be used against it by thousands of rural residents seeking compensation for their wholly unnecessary pain and suffering and the loss of the use and enjoyment of their homes. Meanwhile, diligent scientific researchers are determined to gather and present it. One of the world’s leading researchers on the effects of infrasound on human health is Dr Mariana Alves Pereira. Here she is explaining the science of the noise you can’t hear, but which can very much hurt you. Earlier this year in Ljubljana, Slovenia, acoustics and health expert Dr. Mariana Alves Pereira explained the impacts low-frequency infrasound can have on health. It’s far from pretty. Infrasound is very low frequency (<20 Hz) and is below the threshold of human hearing. It is sensed by the human ear only as pressure waves. Dr. Alves Pereira has a Masters in Biomedical Engineering and a PhD in Environmental Sciences. In her presentation, she explains to the audience that because infrasound is of very low frequency, the wavelengths are very long and thus can easily penetrate thick barriers and into buildings. “This is why it’s a problem to human health.” The waves travel kilometers and are difficult to shield against. The acoustic expert also describes why the dBA scale is inadequate for measuring infrasound and thus are irrelevant for their evaluation. At the 12:30 mark she uses the example of a mink farm in Denmark located near a wind park and so is thus subjected to “acoustic pollution” from the wind turbines. Here she demonstrates how woefully inadequate the methods and measurements often used by permitting authorities for assessing acoustic pollution really are. Later she illustrates how damaging infrasound can be to human health. For example aviation workers have a risk of epilepsy (a neurological problem) that is some 50 times higher than average (22:00) for the occupation and how workers had tumors, and cardiovascular disease from abnormal tissue growth caused by infrasound exposure. At 33:09 mark, Dr. Alves Pereira presents the clinical stages of vibroacoustic disease for occupational exposures. Workers exposed to infrasound more than 10 years developed severe health damage, e.g. psychiatric disturbances, severe joint and muscle pain, blood in the urine or decreased vision, among others. At the 43:00 mark, Dr. Alves Pereira explains how at first they were skeptical of claims made by patients that infrasound had made them sick while at home. In 2000 her team began to look at the claims and found that non-occupational residents who were subjected long-term to infrasound indeed got sick. At the 48:08 mark, Dr. Alves Pereira turns her attention to wind turbines. 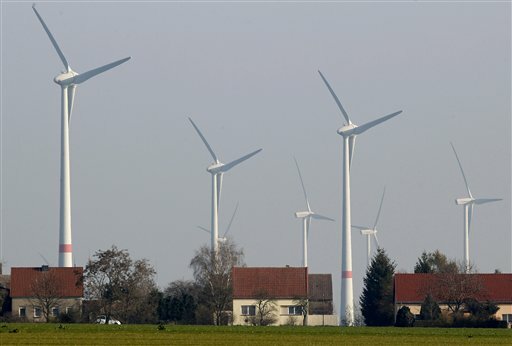 In one example, in Portugal 4 wind turbines were installed within 800 meters of a home and began operation in November, 2006. Five months later in March 2007 the family members in the home were suffering serious health issues and the boy’s performance at school crashed. His energy had been sapped. The horses the family owned developed “boxy foot”. Moreover, the previously mentioned mink farm in Denamrk suddenly saw hundreds of aborted fetuses (53:30), all caused by infrasound from the nearby wind turbines, experts suspect. At the 56:00 mark, Dr. Alves Pereira shows a home in Germany surrounded on two sides by wind turbines located less than 2000 meters away. When the family moved into the home, there had been only two turbines, but then came dozens of new turbines. The family was forced to convert into a bunker in a desparate attempt to shield themselves. In Ireland a 9-year old child developed epilepsy and the 19-year old brother wound up with post-traumatic stress syndrome (PTSD) – as did the worker at the mink farm in Denmark. The house in Ireland had to be abandoned. Dr. Mariana Alves-Pereira has stated publicly that knowing what she knows about the harm from turbines, she would not live within 20 km from wind turbines and yet in rural Ontario we have homes surrounded by them. We have otherwise idyllic neighbourhoods surrounded. In many cases arrays/clusters of turbines are less than a kilometre or two from peoples’ homes. Who made these siting decisions and why were they made? Were these decisions made in order to promote a forced relocation agenda. Were our paid and elected ‘leaders’ complicit? Who in their right mind would quietly acquiesce to having their home surrounded with turbines knowing the findings of Dr. Mariana Alves-Pereira? Denial of harm does not prevent the harm to one’s nervous system and cardiovascular system from occurring over time. How many people are still unaware of the harm that is occurring because they’re attributing the symptoms they’re experiencing to other causes because their doctors are refusing to come forward. These people did not consent to being harmed in their own homes and in their beds. This is a human rights violation that must be stopped now. Have any laboratory experiments taken place on animals relating to this? It seems if this is a valid problem that the effects on wildlife would be considerable. At the other end of the scale I put a high frequency unit into my loft to deter rats. It has been very effective. Don’t give up fighting against these monstrosities. Canadians are much too complacent when it comes to things getting shoved down their throats. I keep sharing facts and figures and articles like these and it’s like they are in lala land. But, but, we are saving the planet! No, no we are not. There is no such thing as Green Energy. We will do the same thing we are doing now. Stripping land and forests, mining rare minerals. Both very carbon intensive. And where will all these parts and components go when their life is used up? The costs to heat our homes, and cook will be astronomical. It is already rising. I see more and more people using wood again. How is that saving the planet? Foresight. Government and politicians have none. We need oil and gas, and coal, to build all these towering, ugly beasts. A balance can be had, but nope. Let’s just shut everything down and go green. Canada is a scapegoat right now. The Liberals don’t care that people will have to choose between heating their homes and food on the table. It’s already happening. Especially in Ontario. Their ideologies will only bring chaos and death.